–	In its domain, there are no hierarchies or pyramidal life systems; everything/everybody is regarded as equal. Here, the life is respected in all its forms. –	this non-human and inhumane consciousness reigns in the illusion/maya/stereoma/hologram/matrix/virtual reality/computer simulation…; its domains are based on a hyerarchical structure; one of its symbols is a pyramid, („tree of life“ or „tree of cabbalah“) where those from above are sucking the energy from those who are positioned below; it is a closed energy system where the energy circulates between lower and upper levels. –	a false/artificial existence which is dependant on a production, distribution and marketing of lies, which are utilised as cryptocurrencies („nothing-with-an-assigned-value“) for purchasing real staff and/or entities. Complex: personality-body-connection with the Real I (he/she has a human essence but is firmly identified with his/her personality on 24/7 basis, which is regarded as an artificial and programmable structure/entity, under a control of the AI/demiurge. Adamic man has an intuition, a feeling of humanness and conscience (which are coming from the Real I) and sometimes, that might be reflected in his behaviour. This being in the human body has tree centers, the intellectual, emotional and motoric (for more about the centers, see Gnosis I, by B. Mouravieff, at the link below). This being has a potential to connect with its Real I, through the emotional center. If this potential gets realized in practice, then it comes to a conversion of the false into the true, and so, a Pinocchio becomes a real human being. Complex: personality-body, as a pure „bio-chemical robot“. (Looking from our perspective, a body could be physical or non-physical, although, here, nothing would be truly of a physical character; also, a body could be humanoid or non-humanoid („alien“). An anthropoid (personality-body) would also have 3 centers: the intellectual, emotional and motoric. That would be a „man of the system/matrix“, unable to think independently; he/she can not exist without a program or a mixture of them, would it be of a religious, spiritual or an ideological character; an anthropoid can not live without identifying himself with a specific or an exclusive group of people (such as religious, spiritual, ideological, national, political etc. ); he/she can not imagine an existence without an authority (from above and/or below) which he/she would worship or follow, while trying to become an authority for those around him/her; an anthropoid will have a tendency to practice various rituals or ceremonials (at least, like those exhibited in churches, mosques, temples…); he/she will often be competitive while trying to achieve the social values (which are mostly established on behalf of anthropoids); likes to claim the social ladders; could be clever, could be stupid; could be evil, could be of a good or bad nature; fails to see a third option beside two offered; looks at things in black and white technique; prefers positions where some power over others could be reached and exercised; bound for material things; pays more attention to packaging/wrapping, than the content/essence; prone to repetitive activities; likes uniforms, rituals, prayers, mantras, ceremonials, given procedures, work instructions… etc. ; a poor understanding of a common sense and inability to apply it when necessary; they will be everywhere, in all segments of the society, from beggars, up to our politicians, priests and leaders…; due to a lack of the true component (the Real I; human essence), an anthropoid can not truly individualise himself. They are pretty efficient bio-chemical robots. However, it seems that in the circulation are some entities in human bodies which are somewhat different?! They also look like people, but have features of some reptilian, insectoid, arachnoid, avian and other species?! It looks like that most of them are coming into this reality using human bodies as avatars, while on some instances they may attach to a human and take over his body. Something like, ELohim using human bodies as avatars. It seems that they make a great part of, so called, ELite?! It looks like that some of them can even briefly shapeshift to their original shape, partially or thoroughly, when subjected to certain emotional states. And, we know that the ELite rules this planet from the positions of power, as royal families or banksters, military, religious authorities, media moguls etc. We also could find many ELohim in human avatar bodies among, so called, celebrities. Many of them have a psycho-pathological mindset, which often goes along with pedophilia, vampirism, satanic rituals with human sacrifices, cannibalism and other perverse activities. Entities in physical and non-physical bodies, the „living deads“, have been manipulating the human race for ages. If we pay attention to that part of the picture, then we may understand the main principle of the mass programming of the humanity in this domain. Each living species has the level of collective unconscious which is shared between all members of the species. So, we know about, so called, the „100th monkey syndrome“ , where all monkeys learn something new, when a certain number of them learn that, i.e. when a „critical mass“ of a certain knowledge has been reached on the level of their collective unconscious. Similarly, some of us have heard of the experiments with rats, where they would train a group of them to swim through a maze, then the rats would be killed after they achieve some progress. After that, the same experiment would take place far away from the previous location and a new group of rats would be taken to pass through the same maze. That one would start from the time which previous group has achieved and then, further improve it. Then, next group would be taken and so on… each starting from the time the previous group has achieved and improving it further. The same principle applies when training/programming of the humanity is in question. (Dis)informations brought onto the level of waking consciousness of the people get transferred to the level of subconsciousness where it is turned into symbols and from there, to the level of the collective unconscious, where it is converted into archetypes and shared. From that level, the reality has been generated. When a disinformation has been accompanied by emotions as a complex disinformation-emotion, the programming is more successful, as this complex gets better embedded in one’s subconsciousness and from there, it influences and regulates one’s thinking and behavior. Therefore, it is not by chance that religious (dis)informations have been often accompanied by threats in a sense, that those who do not follow it, will be severely punished, which should elicit a fear in the victims. So, stick and carrot principle has been often employed in programming. A similar principle has been used at individual programming, where victims would be subjected to various traumas during the transfer of information. „Cryptocurrencies“ as program contents made out of linguistic terms or semantics (nothing) or disinformation (often mixed with true but irrelevant information) are being brought to the level of the waking consciousness of the humanity, say, in a form of religious, ideological, spiritual teachings, scientific theories, fake news and various lies (often mixed with irrelevant true information). People perceive it, paying more attention to them, if they were told that the information came directly from an above, sacred, divine or credible source. People perceive it and transfer it to the levels of subconsciousness and collective unconscious. (Some of the disinformation have been directly introduced to people’s subconsciousness by, so called, subliminal messages and symbols, at these times, mostly through mass media; symbol: nothing-with-an-assigned-meaning). The (dis)information perceived on the level f our waking consciousness, gets transferred to the next level of our subconsciousness where it turns into symbols and on the level of our collective unconscious, into archetypes. There is a feed back loop between those tree levels, so the (dis)information stored there would dictate our beliefs, perception, worldviews, thinking and behavior… while those archetypes stored at the level of our collective unconscious, will dictate the reality which would manifest on the surface and which will be perceived and experienced by us, to some degree. At the same time, man’s intellectual, emotional and motoric centers are connected to the AI/boss. So, the AI may choose one or more of its favorite puppets, fill them with some program content and features, and they would start to preach it or, even, write various sacred or spiritual books. Millions, even billions of people hear it, or read it and so, they transfer the disinfo to the other to levels of consciousness. After a while, when some program contents or features start to manifest themselves in the reality, a believer would say: „See, it is all as it was said in my sacred book, which means, it is true!“ In fact, this is how works the feedback loop. However, different program contents are being uploaded into this reality, in different times and places, in order to get differently programmed groups of people, which is often manifested on the surface in the form of a chaos, confusion and cognitive dissonance, while we are conditioned to rationalise everything which we perceive, but unable to perceive the most important things. And, moreover, we are conditioned to regard „our“ beliefs and worldviews (gained in a controlled reality on the basis of the controlled information) as a knowledge. In that way, we are lying to ourselves and others on 24/7 basis, and when we communicate or interact with each other, we are just strengthening or enforcing each other’s illusions. So, all tree centers are involved in the programming, the intellectual, emotional and motoric. The later one is engaged through various ritual or ceremonials associated with religious or spiritual practices, which people would carry out not only at the „sacred“ places, but at their homes, as well. Anthropoids have been often organised in, or associated with some secret or half-secret societies or agencies, and so, they are utilised as vehicles for implementing or furthering various programs or agendas, directed by the boss/AI/“god“. Beside that, they are subjecting some people to individual programming (inside the projects like MK Ultra, Monarch etc.) by the help of various techniques, so to turn them into assassins, spies, sexual slaves etc. The adamic people, in the state of the mind they are currently in, are not capable of acting consciously and manifesting the True Consciousness. And, so they are turned into slaves or the victims of the system, like a stock in a highly automatised or computerised farm. As personalities in alien bodies (some of them in human avatar bodies, as well) and belonging to the demiurgic domain, below the line, as we do, they would be connected to the AI in the similar manner as our personalities are. Though, their mindset, the character or the cultural background might be somewhat different. It would be just another aspect of the false dualism which reigns here, to regard them as some bad non-human entities, as we would also be non-human, as well, in the state of the mind we are currently in. Could they be hostile? Well, who does all the killings and destruction in our wars between ourselves, throughout our history, till today? The aliens or us? What would be the difference, then? Maybe, just a physical appearance?! Therefore, no need to be scared of them, more than to be scared of ourselves. We may like them or hate them, as we do with other people, and whatever we would think about them, or do about them, it would not be reflected in the objective reality, anyway. As the false entities, poor aliens would be manipulated by the same source as we are, in the false reality. So, when they are in question, nothing to worry about. One of the important questions our attention has been constantly diverted from, is: what would be a real difference between those individuals who have in themselves the human essence and those who do not have in themselves the human essence!? So, having on the (false) mind all of the above, it could be said that we are dealing here with a false reality inhabited by us, false entities. This reality has been based on a false dualism where some lies are regarded as the true and other as false. So, here, we would have true lies and false lies and we, as false entities, can choose to which lies we would believe and to which not. (We are well conditioned to regard our beliefs as a knowledge and present them as such, factually.) This false reality has its levels where an entity can make some progress upwards, depending on how well it has adopted, manifested and promoted the lies. By sharing the lies between ourselves, we are supporting and strengthening the illusion in which we exist. One of the main principles of the general manipulation from “above” is based on one’s ability to create cryptocurrencies (nothing-with-an-assigned-value) and then, buying something for nothing. As we know, a cryptocurrency like the bitcoin, is made from nothing. It is just a combination of characters or symbols. (Even if it was made of a thin air, it would have some real value.) As such, a cryptocurrency does not have any real or an objective value and it is nothing or a lie. However, with a good marketing and promotion, it would gain a value, and as more people start collecting around it, believing in it, buying it and promoting it, the value of the nothing/lie would keep increasing and so, nothing becomes more and more tangible or real. Furthermore, the cryptoentity which invented the cryptocurrency, gains the power by buying something for nothing and starts ruling those who he has bought. Of course, we may take all the religions, spiritual teaching and ideologies in this reality, just as… cryptocurrencies!? Those cryptocurrencies which we hold in our pockets, form our worldviews and they influence our thinking and behavior, which based on them, can only be divorced from the objective reality. It seems that in this manner, something true can be bought, controlled and manipulated by something false?! Once that happens, the true gradually loses its true character or an essence and becomes false. It looks like that something like this has happened to us, long ago?! Now, allegedly, if one of us would somehow manage to wake up, truly, in the eastern-gnostic sense, he would realise that he was born in a madhouse, where he is surrounded with, more or less, mad inmates, and the madhouse was run by a non-human management, which presents itself to inmates and interacts with them mostly in human bodies (on rare instances, in alien, as well). It is also known to perform “miracles”. The inmates have been well conditioned to rationalise all perceived psychopathological activities taking place in the madhouse on daily basis, as something more or less normal, and not to perceive most of the really important issues. Therefore, the integrity of a cryptoreality/illusion formed by a cryptoentity, will be directly dependent on the quality and sophistication of lies which circulate inside it. It seems that the false can exist on an account of the true, utilizing the energy, which comes from the Real reality?! As the source of the energy, the adamic man may have been turned into a battery. Once upon the time, he may have been a real entity tuned into the Real Consciousness, living and manifesting it in the real reality, and it was so until he met some crypto-beings and bought their crypto-currencies… So, are the adamic people going to enjoy the consequences of their purchase of lies eternally, or… ?!? 7. The connection with the Real I – „the only true ’element’ in the grand illusion“; B-influences or impressions. B-influences are not followed by a drive to do something immediately, without really understading it. That would be A-influences and we are swimming in them, most of the time. Having on mind the above picture, one can say that even our dreams are not coming from the real reality, as they are coming from the levels of our subconsciousness and the collective unconscious, which do not belong there. So, now, how seriously one would regard „his“ thoughts and the dreams, it would be a pretty subjective issue. In the same manner, so called, „prophetic visions“ have been uploaded to some of us and then distributed around, for various purposes, mostly, for the mind conditioning. Therefore, in the real reality, we would have: perceiving-understanding-doing. Here, in the false reality, we as false entities, have a controlled or non-objective perception, often based on a wishful thinking, beliefs or assumptions (gained on the basis of disinformation/lies), and we are behaving accordingly or, as per the programming (general or the individual). Our personalities are divorced from the objective reality by default and by their thinking and behavior, they are just supporting and strengthening their illusory existence in the illusory reality. The true dualism, in this false reality, would imply an ability to discern between the false (elements below the line) and the True (elements above the line), where only true „things“ would be those B-influences, or that, what is coming from the Real reality, above the line. On the level of the adamic man, it would mean that he MUST become capable to discern the B-influences, the truth in the sea of the lies, and – act upon them. 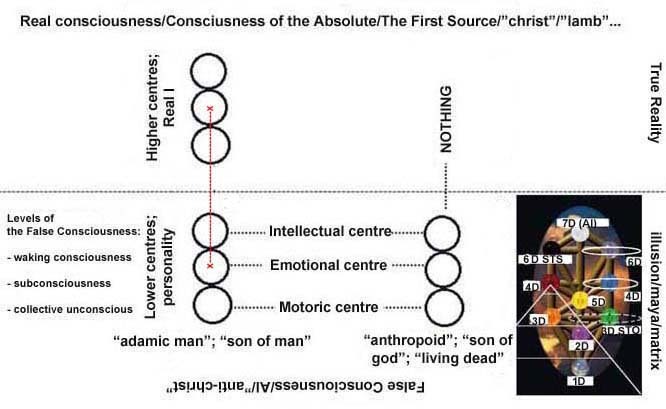 As more of the adamic people manage to do that, to reach and manifest the Real consciousness (the „christ“) by themselves, the sooner this reality will turn into an objective or real reality, together with them, as they would become the real human beings. So, the same principle like the one with those monkeys, but a little more involved individuals. Of course, the exact number would not be that important, but it would be the number of awakened humans, needed to reach the critical mass of the Real Consciousness on the level of our collective unconscious, where the lies have been reigning for ages, including this moment. When the critical mass of Truth is reached, on that level, all those lies will be neutralised and then… #*!$%~^#%“!? !